I am so excited to announce a new series I am creating for my blog: The Styled Series. This series will be all about how I incorporate styling into my clients’ wedding days and how you can use these tips and tricks too! “What is styling?” you ask; the dictionary definition is “to design or make in a particular form” and in the wedding world, it is the art of arranging objects and elements to tell the story of your wedding. Those elements can be styled specifically for a photo, as part of your tablescape, or as part of the greater design of your wedding! Styled photos have garnered a bit of a bad reputation in the last few years because people were incorporating styling only “for the ‘Gram” if you will. Planners, designers, photographers, and couples were styling images that weren’t true to the wedding, only trying to get that “Pinterest-worthy” photo by using elements that are popular, not elements that had meaning or were part of a large picture. 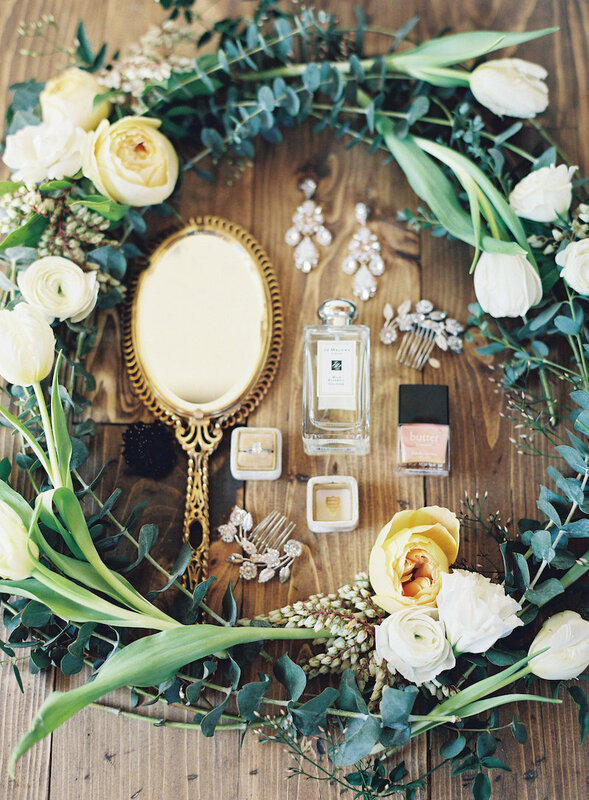 In my mind, wedding styling should contribute to the greater story of your wedding day! Whether it is incorporating your Mother’s pearl brooch or postcards from your travels, creative styling evokes emotion and memory. That isn’t to discount taking a photo just because it is beautiful (because I LOVE pretty as much as anyone), but those images shouldn’t create a false narrative about your amazing wedding day! So let me climb down off my soapbox and let’s get into the fun parts! Here I am breaking down what you need to get gorgeous photos of your rings on your wedding day! Click on any of the images to see additional information and the super talented creatives involved! There are probably no items of jewelry with more emotional resonance than wedding and engagement rings. Your engagement ring typically will start the journey to your wedding day and your wedding rings are the eternal symbol of your marriage. Plus, the rings are always totally gorgeous! Prepare yourself for inspiration overload! I believe it is incredibly important to capture photos of your rings on your wedding day. Not only do those photos help tell the complete story of your wedding, but rings can often change through the years. For example, my Mother-in -Law gifted different parts of her wedding ring to each of her sons for their wives. And my husband’s ring actually had to be changed out a few months after our wedding, so although he now wears a different ring, I still have photos of the ring he married me with. So how can you make sure that ring detail photos are captured? It is also really important to let your photographer have creative license with these photos. I guarantee that any great photographer will know to use the ring box you’ve provided, but she may also have spotted an incredible architectural element on her way inside and has an artistic vision in mind! 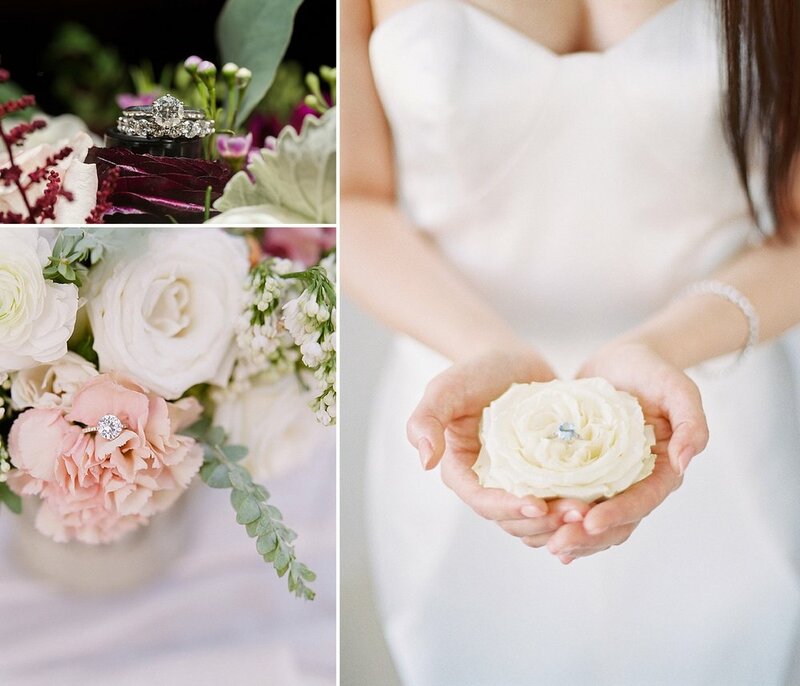 Below I have gathered some of my favorite ring shots from past weddings for your inspiration. I have tried to group them into categories, but truly your imagination is the only limit. Just be sure to keep track of your rings, especially until you say I do! The first six groups really don’t require that you buy any ring-specific styling items, the last two will require more of an investment. This first group is so elegantly simple, no fancy velvet or antique ring boxes required. Just a pretty surface and some nice light! If you want to elevate the styling, include a bit of ribbon and a shallow dish or coaster or use a styling prop like this oyster shell which you can probably find around your house! 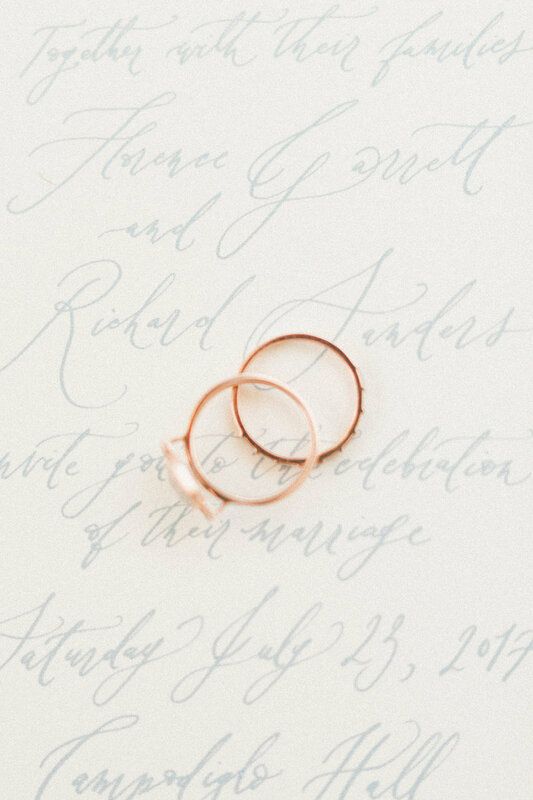 Most couples will have a paper invitation for their weddings and styling your ring on top of the invitation is a sophisticated way to capture both details. Add a fresh bloom or a ring box or let the rings just rest on the paper - it will be beautiful however it is styled! And don’t forget, if you had some lovely, custom calligraphy, show that off too! 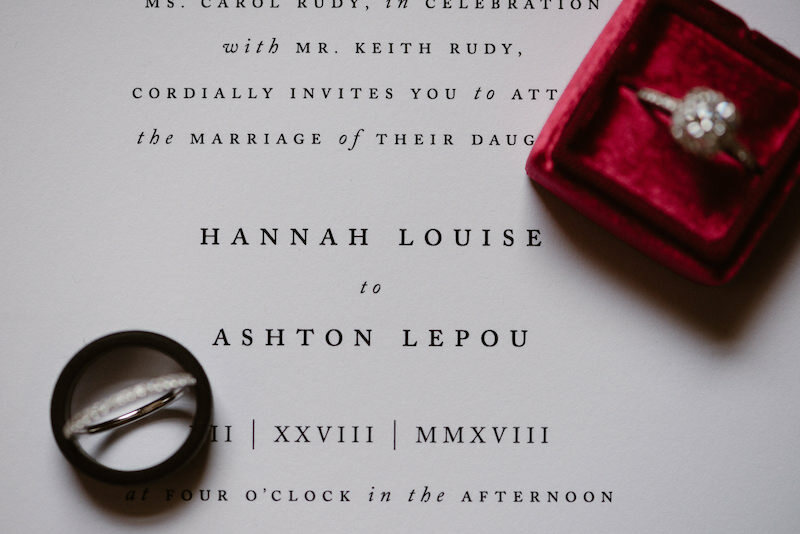 Even when the focus of the image is the invitation, rings add beautiful color and sparkle! 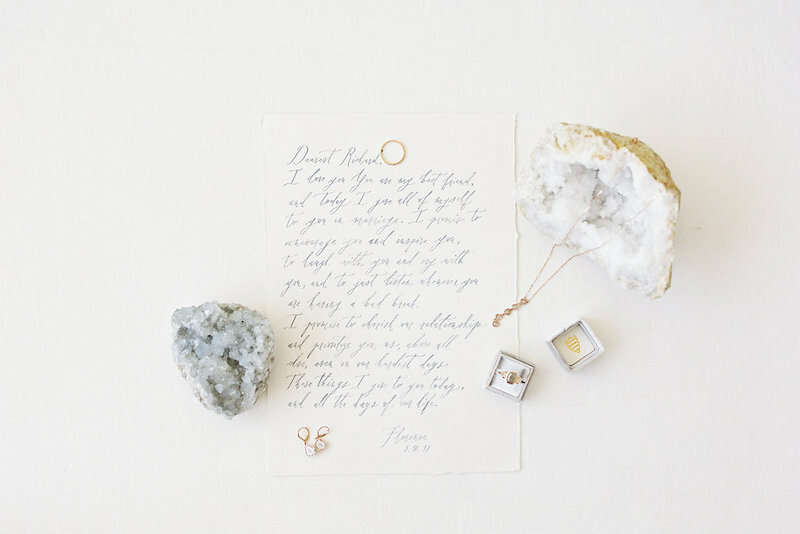 Is there any element of your wedding that your ring is tied more closely to that your vows? 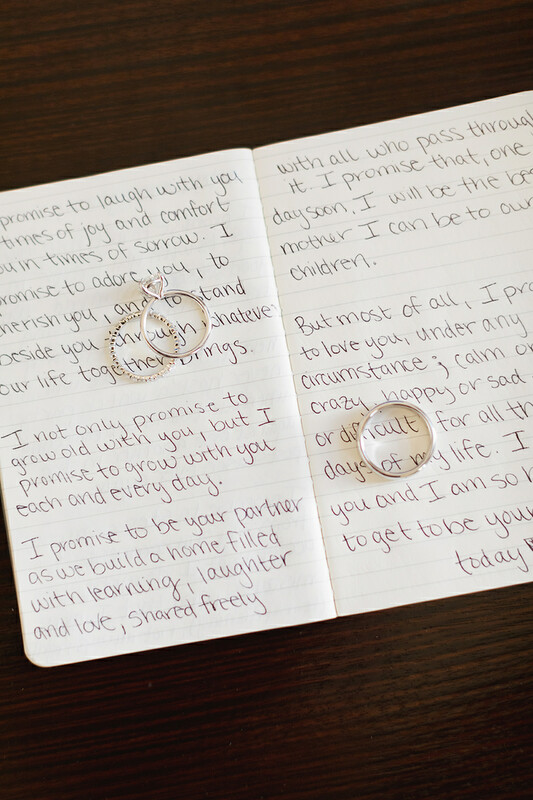 I love when couples use vow books or have their vows written in beautiful calligraphy as a memento from the wedding day. 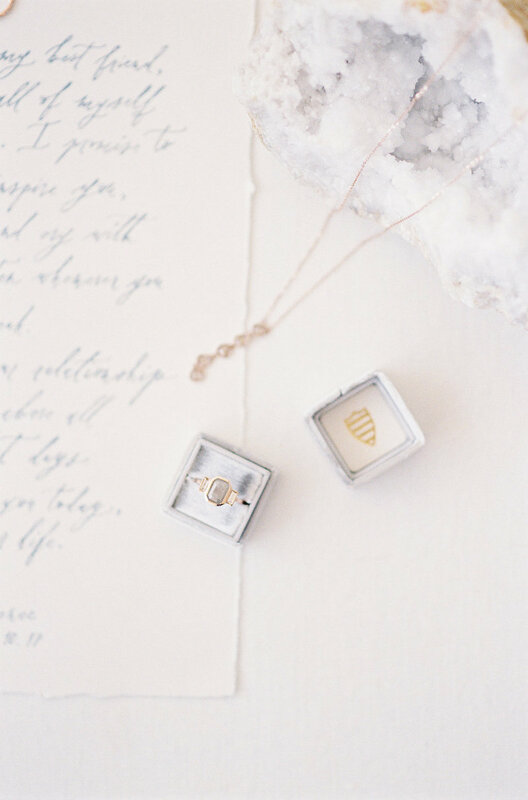 You can either open your vow book to capture some of the words or keep things a bit more private by styling your rings on top of your vow books. This series shows that the same ring and vows can be styled and captured multiple ways to create a variety of photographs. 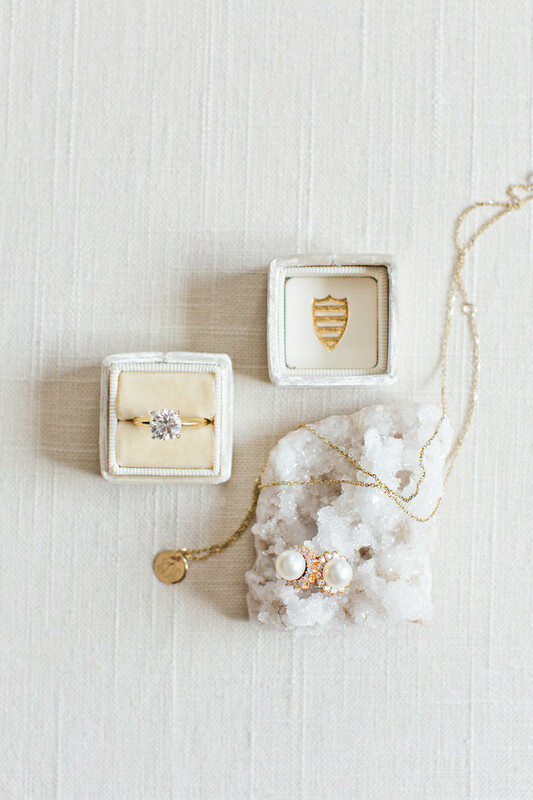 Create a complete picture of your wedding jewelry and accessories by styling them with your wedding rings. Or, if you have a very sentimental item, like the Marine’s Sword below, use that for a photo that will become an instant family heirloom. Have you been dreaming of your desserts since you got engaged? Grab a photo of your engagement ring perched on top of some macarons. 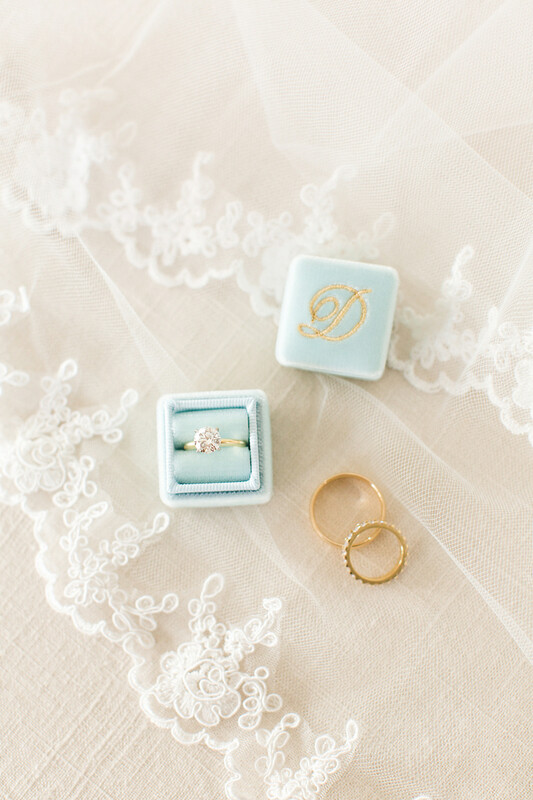 A velvet or antique ring box can help set your ring apart in these shots and add pops of color. 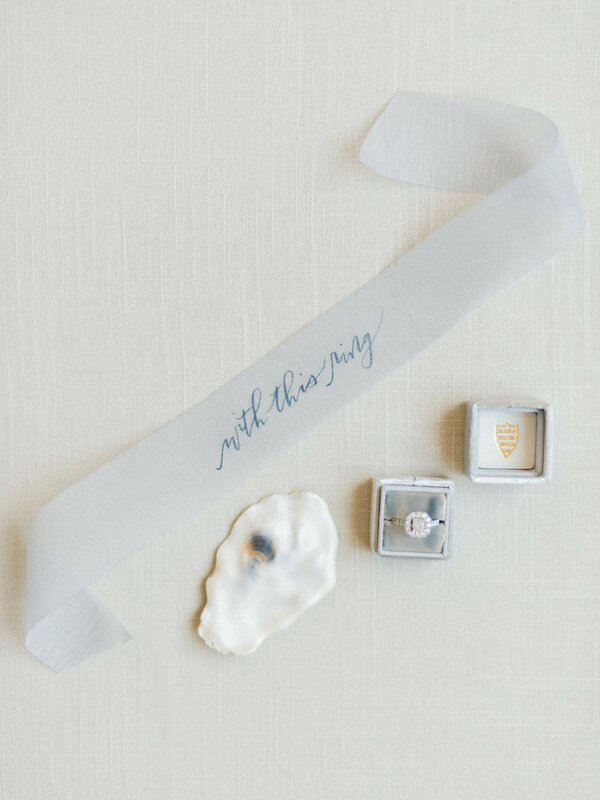 Or consider having your calligrapher add a sweet hand-lettered ribbon that can be tucked into your box of wedding mementos. There may not be another time in your life when you’ll be surrounded by so many gorgeous flowers as you are on your wedding day! So use their natural beauty and amazing color as a stunning backdrop for your ring. You can get creative and use a large, full bloom as a makeshift ring box and cup it in your hands for a gorgeous portrait! 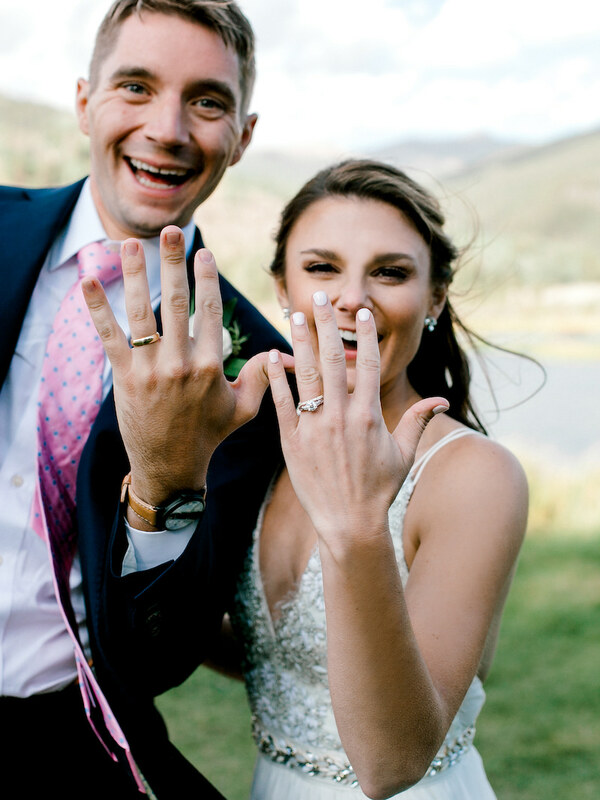 Do not forget to get a manicure before your wedding because your photographer will definitely want some photos of you showing off your rings on your wedding day! 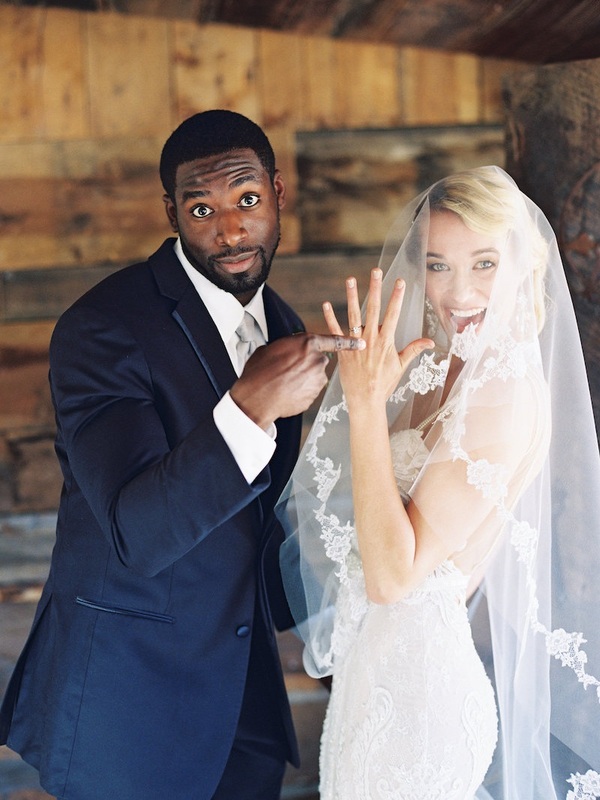 Your rings will look amazing while you’re holding your bouquet, relaxing during hair and makeup, or hugging your fiance during your first look. I also this it is incredible to capture a serene moment resting your hand “just so” for an elegant portrait. Or a close up photo of your hand delicately lifting your wedding gown. These next two sections will require a little bit of investment, but the photos are well worth it. 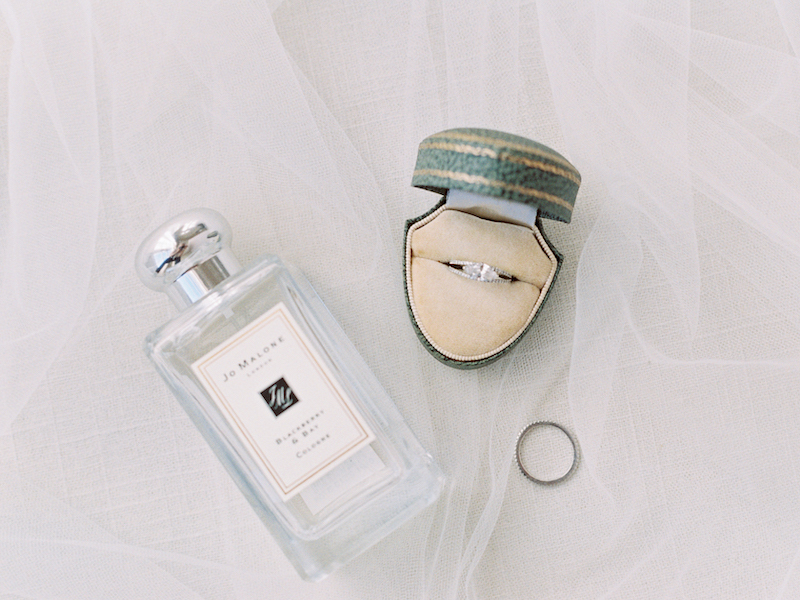 Nothing showcases a stunning ring quite like a ring box. Before you panic about buying one if it isn’t in the budget, ask your planner or photographer if they have any for rent or search out some specialty rentals companies in your area. I do think they are an amazing keepsake if you can afford the investment, something to pass on to future generations! Velvet Ring Boxes (like The Mrs. Box, but there are others out there) are popular for a reason. 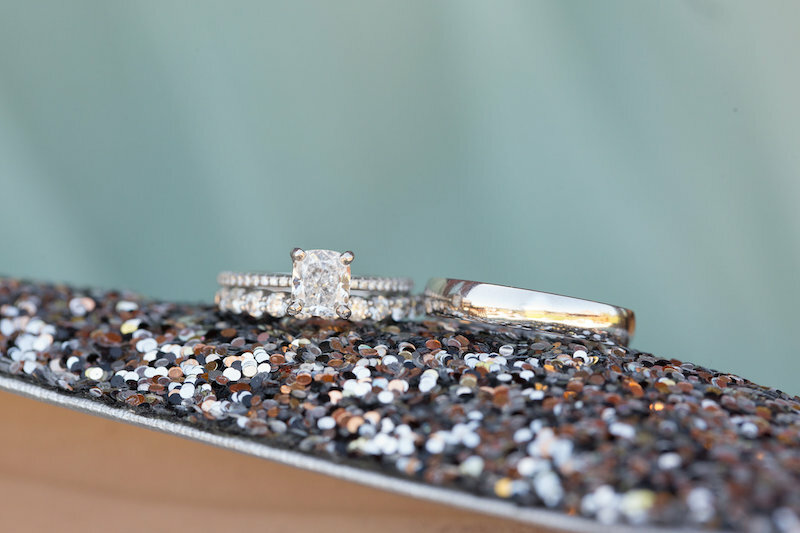 They give your ring a clean backdrop, have a timeless appearance, and all your rings to be photographed “standing up” which shows off all that sparkle! 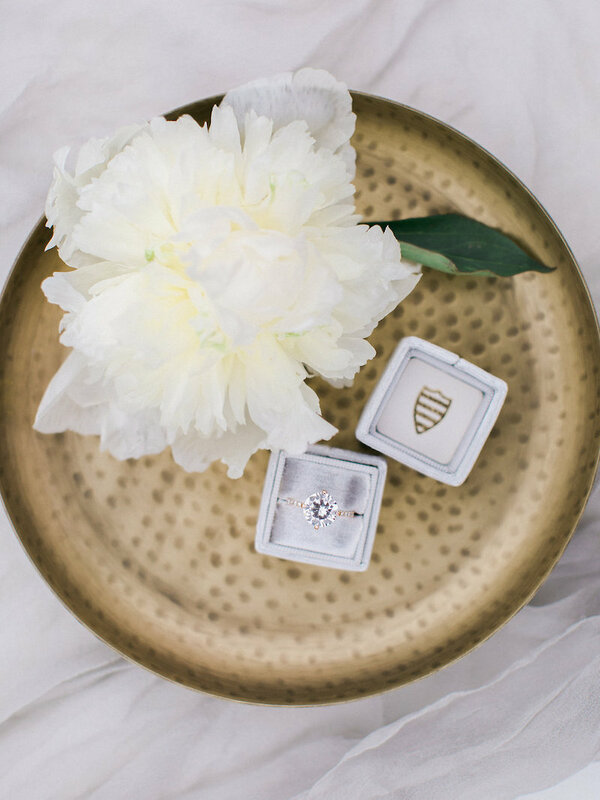 Below is an example of how you can style a ring three different ways with a ring box: clean and standing alone, with a flower and a textured tray, and from the side, to capture the accent diamonds lining the prongs of the ring. Because velvet ring boxes elevate rings and have a clean design, you can style your rings on fun patterned backgrounds. The rug and tile used below had special meanings to the couples and so capturing these photos had extra significance. Antique ring boxes are gorgeous and a bit more distinctive than the more recent versions, but they come with a heftier price tag. And you have to be careful to buy ones that are meant for rings if you want your ring to stand up inside of it. But they add a vintage touch to a ring shot like nothing else can! Floral collages make for stunning and totally unique photos, but they do have a cost. You’ll need to order extra flowers from your florist and budget time on your timeline to create the floral collage (often a florist will create it, but sometimes your planner, stylist, or photographer can as well). These can be as minimal or extravagant as you like. You can just use a few leaves from a rose and really let your ring shine, or you can incorporate your ring into a large flat lay with lots of blooms for a more complex design. You can also use a wreath-like collage to tie all your beauty and jewelry elements together. This is the most time-intensive and expensive option, but it creates a stunning image that is totally unique to your wedding! 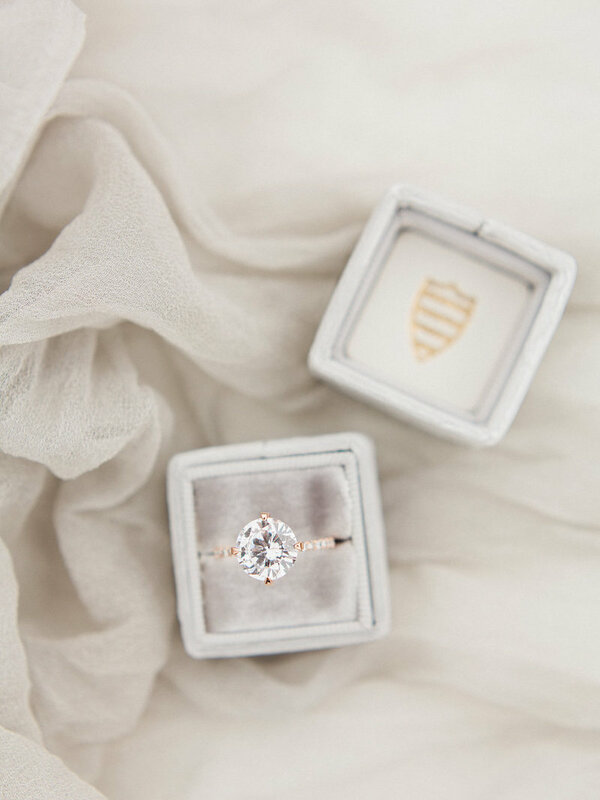 There are so many incredible ways to style your ring on your wedding day and ring photos really are such heirlooms. I would love to see how you styled your ring! Post it on Instagram and use the hashtag #tssringshot or mention @the_styled_soiree in a comment! Next month, in this series, I’ll be breaking down shoe shots - maybe my favorite type of detail photo ever! If you want to make sure not to miss it, you can sign up for my newsletter here (I promise, I only send super fun stuff - some of which isn’t available anywhere else!)! A huge thanks to all of the amazing vendors who make these incredible wedding images possible! You are all so incredibly talented!